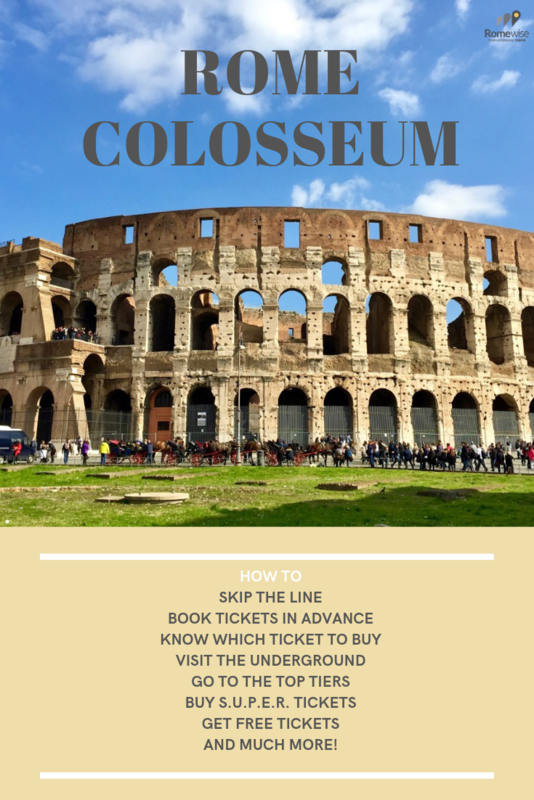 Wondering how to get your Colosseum tickets? As of spring 2019, the rules have changed! This is the line at the Colosseum for people who don't have tickets. Don't let that be you! Find out how to skip the line and get the best Coliseum tickets. 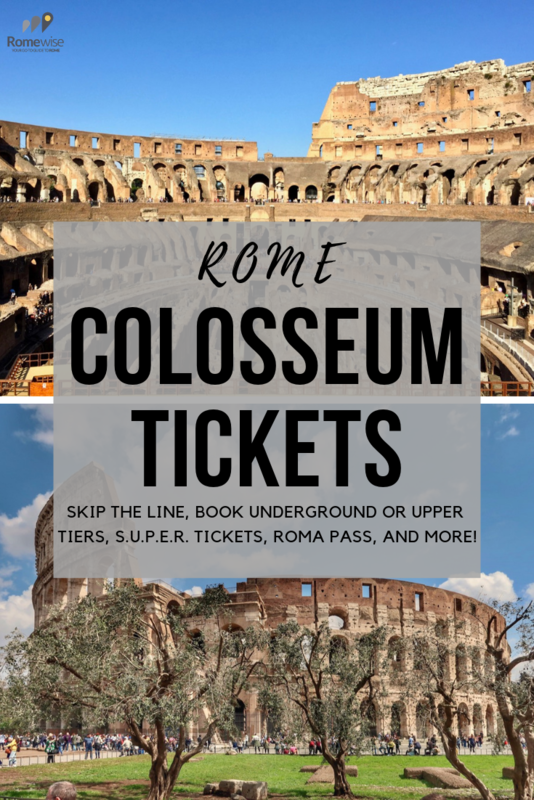 On this page, I'll describe all the different types of Colosseum tickets available, and tell you how to get them with the least hassle and confusion. It doesn't seem like it should be that complicated to get tickets to the Rome Colosseum. But there are different types of tickets that include different things. There are also passes, free days, and seasonal tickets. And frankly, the procedure on the official website is a little confusing. I have visited the Colosseum every which way you can imagine. I have done all the things on this page, so I am in a position to lay it out for you in detail so you can't go wrong. Trust my experience! Besides wondering which ticket you should get, you probably want to know how to skip the line. You need to purchase your Coliseum tickets in advance. So for all of the below types of Colosseum tickets, I will explain the different options for doing just that. What about the Roma Pass? The standard price for Colosseum tickets will go up to 16€ in November 2019. Please check back as I always update these details as soon as they are available. There is a 2€ reservation fee. Even those with reduced or free tickets should reserve. The only way avoid the reservation fee is if you walk up to the ticket counter and buy your ticket on the spot. This is the way I use to do it, by going to the Palatine Hill ticket booth (where there was usually a much smaller line or no line). Here are the lines at the Colosseum ticket counter in January. Coming to Rome in low season winter is one way to buy your Colosseum tickets directly, with no lines, no waiting, and no extra fees. 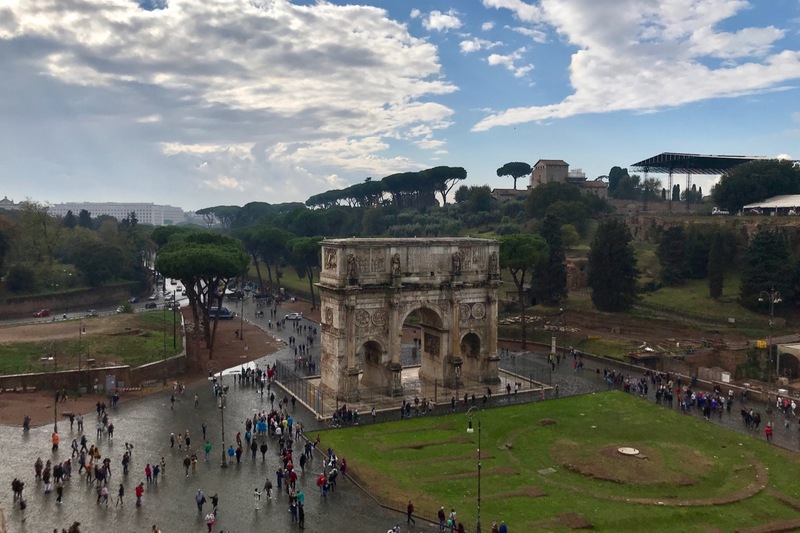 If you don't want to book in advance, or left it too late, or just didn't know, you can try going to the Colosseum ticket booths, or even the ticket booths at the Palatine Hill or Roman Forum, and seeing what's left available for that day. Your best bet would be to go in the morning, so you have the most options for available time slots ahead of you. When you buy your Colosseum tickets in advance, you will need to pick a date and time. Unlike tickets to the Vatican Museums, which also have a date and time stamp, the number of Colosseum tickets they sell are limited each day. For security reasons, but also because the Colosseum is a 2,000-year old monument that needs to be protected, the maximum capacity inside is 3,000 people at a time. During busy months, you may find that tickets are sold out for a time you want, or even for a given day. In high season, tickets will sell out each day. Unfortunately, despite apparent efforts on their part to make their website more user-friendly, it is still not as straight-forward as one would like. Sigh. Visit the website for CoopCulture. If it's not already, you can set the language to English in the top right corner. If you are not already on the page for the Colosseum, click Places, Archeological Sites, then the Colosseum. The below is a screenshot of the CoopCulture webpage for purchasing tickets. This is what you should see when you begin the process of buying Colosseum tickets through CoopCulture, their official vendor. To purchase online, click the "Buy Now" button. 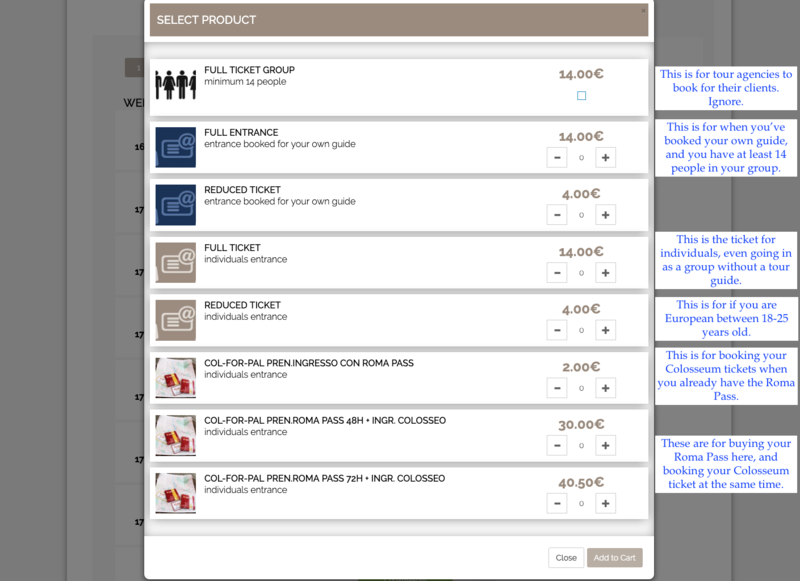 The next page you come to will give you all the different options for buying Colosseum tickets, such as regular entry, underground, panoramic view etc. For regular entry, click the first option "Ordinary Admission." This will take you to a new page. Once you click details for ordinary admission, you should see this. The price is 14€. That's 12€ for admission + 2€ to book in advance. Click Details. You will come to yet another page, that says "Buy now." This is the page that tells you all the fine print about what's included, different pricing options, and rules for entering the Colosseum. Don't go crazy reading it all. The important things to know are that you should arrive at least half hour before your scheduled time, and you cannot be more than 15 minutes early or late for the time on your ticket. As soon as you click "Buy Now", the screen jumps down the page to a booking calendar. Here you can select your dates and time. You can also see how many tickets are left available for each time slot. Select the number of tickets you want and add to cart. When you are ready to check out, you will need to provide some personal details so you can pay and receive a digital confirmation. You can only pay with Visa or Mastercard. They do not accept American Express. You can call CoopCulture to book your Colosseum tickets. There are options to speak in English or Italian. Make sure you are prepared to give them a Visa or Mastercard number, and contact details. That "+" is what you dial from your cell phone. It means "the following will be an international call, beginning with the country code, which, for Italy, is 39". If you are not using a cell phone, or don't know how to find the + sign, you can also use the dialing sequence, which varies from country to country. When dialing from Europe, the + can be replaced by "00". When dialing from the US or Canada, the + can be replaced with "011". There are also online ticket agencies that make it easy to buy and reserve your Colosseum tickets in advance. You will pay a small fee for this, but it's seamless, and the tickets arrive on your smartphone or tablet. You can still go directly to the ticket offices at the Colosseum and try to buy your ticket there. And this is a big "but": Now, you must pick (or be given) a specific date and time to visit the Colosseum. The Palatine Hill/Roman Forum do not require a timed entry, so you may visit that site at your leisure. Up until spring 2019, you could purchase a general admission ticket to the Colosseum online, and then validate it on the day you decided to go. If you bought it on site, you would just go in right after you bought the ticket. As of early 2019, the authorities that manage the archeological sites in Rome and other parts of Italy are looking for better ways to manage the crowds. This is for the sake of the visitors as well as the sake of the monuments themselves, which simply cannot bear the stress of too many visitors at a time or on a given day. For this and security reasons, not more than 3000 people at a time are allowed inside the Colosseum. So now, whether you book online or on the spot, you will be given a specific time you can enter the Colosseum. And they are pretty strict about it. You have about 15 minutes on either side of your allotted time to get in. They look at the time on the ticket, so be punctual. Back to the "BUT" I mentioned above - If you show up at the Colosseum (or Palatine Hill or Roman Forum), you may find there are not more times available that day. Or, you may find that the only times available are inconvenient to you. This is going to be true particularly in high season (April - mid-October). So now I am going to strongly recommend you just plan ahead and book your ticket in advance. Then it's done and you don't have to worry about it or risk wasting time "winging it" at the ticket office. What does S.U.P.E.R. stand for? Where the Colosseum is concerned, the acronym S.U.P.E.R. stands for Seven Unique Places to Experience Rome. These sites are located on the Palatine Hill and Roman Forum, which constitute one large archeological park in Rome, next to the Colosseum. What is the complete S.U.P.E.R. ticket and where can you buy it? A big caveat - Visit the Colosseum early enough in the day so that when you go upgrade to this S.U.P.E.R. ticket, you still have some time left in the day to see at least some of the sites. With this ticket, you still have a second day to enter the Palatine/Forum, but you should give yourself a head start and visit some of the sites on the first day. For 18€, you get a S.U.P.E.R. ticket that includes the Colosseum, Palatine Hill/Roman Forum, and all the sites on the S.U.P.E.R. ticket. You still have one day to visit the Colosseum (no re-entry), but unlike the standard entry 12€ ticket, in which you can visit over 2 days, but only once at each site, with this S.U.P.E.R. ticket, you can re-enter the Palatine Hill/Roman Forum one more time, over a two day period. At the time of this writing, you cannot buy this ticket on the CoopCulture website, nor are any ticketing agencies selling them. Here's how to get the complete S.U.P.E.R. 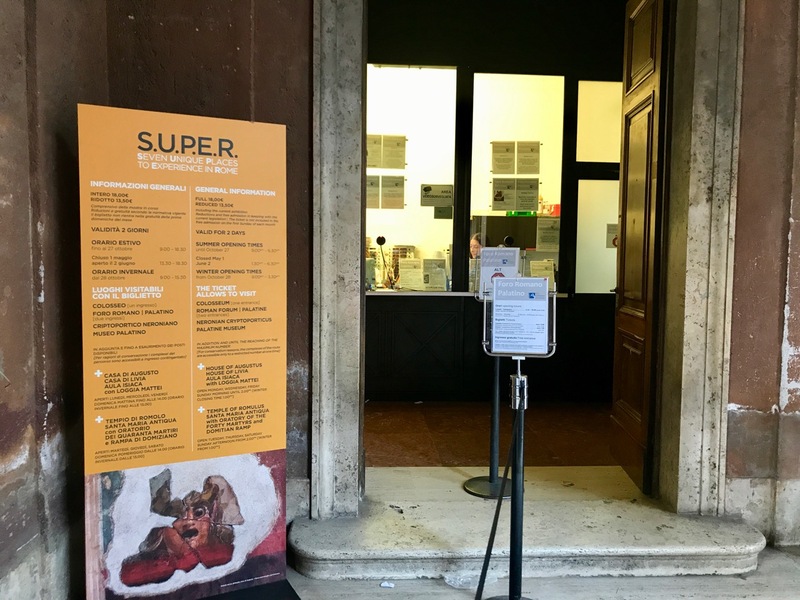 ticket: Buy a standard Colosseum ticket (12€), and once you've visited that, walk over to the entrance of the Palatine Hill or Roman Forum, and upgrade to the S.U.P.E.R. ticket by paying 6€ additional. What is the simple S.U.P.E.R. ticket and where can you buy it? This ticket may be useful if you don't want to go inside the Colosseum, or if you've already visited the Colosseum on another occasion, or if you plan to visit the Colosseum at night. Night visits to the Colosseum (spring - fall) do not include any entry to the Palatine Hill/Roman Forum. The latest offering from CoopCulture is the pared-down S.U.P.E.R. ticket: this ticket allows you a one-day, one-time visit to JUST the Palatine Hill/Roman Forum, and to those seven sites listed above. Colosseum entry is not part of this ticket. The ticket costs 16€, and you can buy it online at CoopCulture, or on-site at the Palatine Hill or Roman Forum ticket offices. You can also buy this ticket using an online ticketing agency. Unlike Colosseum tickets you do not have to pick a date and time with this ticket. You have a month to use it from the date of purchase. Bottom Line - Which of these Colosseum Tickets Should You Get? This is the view of Capitoline Hill and the Roman Forum from a lookout point on the Palatine Hill. So, which ticket should you buy? The Colosseum/Roman Forum/Palatine Hill standard ticket, for 12€? The Colosseum/Roman Forum/Palatine Hill SUPER ticket, for 18€? The Roman Forum/Palatine Hill only SUPER ticket, for 16€? If you have limited time, and/or just want to see the basics (there is still tons to see! ), then get the standard entry ticket for 12€. If you are on a budget, get the 12€ ticket. If you have time to take two days exploring these ancient Rome sites, and a strong interest in ancient Rome, I really suggest the full 18€ super ticket. It’s only 6 Euros more than the standard ticket, and for that additional 6€ you get an additional day to visit the Roman Forum/Palatine Hill, and you get access to all the sites on the SUPER ticket. Even seeing 1 or 2 of these additional sites will make it worthwhile in my opinion. If you have already seen the Colosseum, or don’t feel like seeing it on the inside, you could consider this new 16€ Roman Forum/Palatine Hill only ticket for 16€. At this point, I’d spend the additional 2 Euros if only to give yourself the extra day allotted with the 18€ SUPER ticket. When and how can you visit the Colosseum for free? This is the line at the Colosseum on the free Sunday in early February. Is this a good way to visit the Colosseum? Sure, if you are on a budget. Just remember, you cannot book in advance, and the lines will be long, even in the lower seasons. This is because even when it's free, they still give you a ticket. Also, you still have to go through security and the turnstiles, so it creates a line. Also know that on the free days, you cannot get a SUPER ticket or any of the special visits such as the underground or upper tiers. More about those below. Who is Eligible for Free Entry to the Colosseum? Some visitors are eligible for free entry year-round. Anyone disabled and their companion if the companion is assisting that person. You must show proof of disability. Be prepared to show ID. Even those with free entry need to book a date and time (and pay 2€). To see the more specific requirements, and see if you qualify for free entry, visit the official page for the Rome Colosseum, CoopCulture. You could also TRY to just go to the Colosseum with your Roma Pass, which will allow you to skip the line until you get to the ticket counter. From there you will still need to reserve a date and time, but your choices may be very limited. I strongly urge you to book your date and time ahead of time to save yourself this aggravation. If you are in the process of purchasing the Roma Pass or other type of Rome City Pass, and you choose the Colosseum as one of the sites you want to visit free with the pass, you will have to reserve a date and time while you are booking the pass. You're ready to go! When you visit CoopCulture to book your Colosseum tickets, you have the option of booking the Colosseum visit + the Roma Pass all at once. This will give you the "free" entrance to the Colosseum, with a date and time, AND the Roma Pass (to be picked up when you visit the Colosseum.) You're ready to go! Above, I outlined all the steps for getting standard (or reduced) Colosseum tickets via the CoopCulture website. The following are tickets for special Coliseum visits. They may not always be available. Check with CoopCulture. One very cool thing to do when you visit the Colosseum on the inside, is to walk out onto the arena, a part of the floor that has been somewhat replicated to what it may have looked like 2000 years ago. From this vantage point, you will have a sense of what it feels like to be on the stage of the Colosseum. You will also get a good look at the underground from here, although this visit in particular does not include the underground. 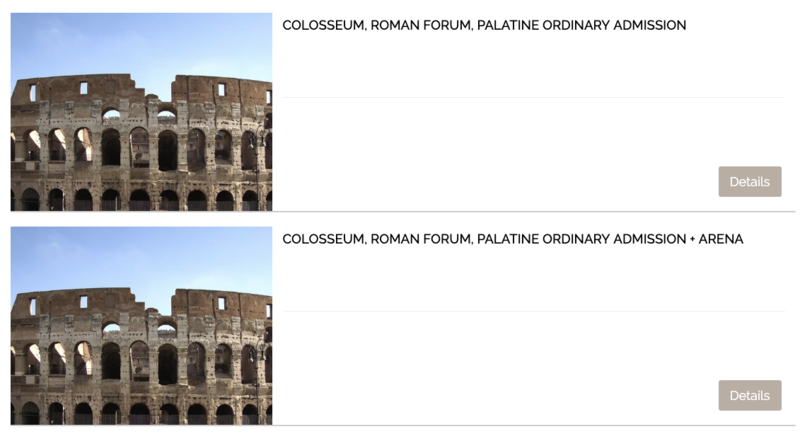 On the main booking page of the Colosseum tickets on CoopCulture, I showed you above how the second option is to buy standard Colosseum tickets + arena floor. However, you cannot just book this visit here. It is for tour agencies or tour guides to book. The only way to book this visit is with a tour group. A visit to the Hypogeum (underground) of the Colosseum is really worth doing. 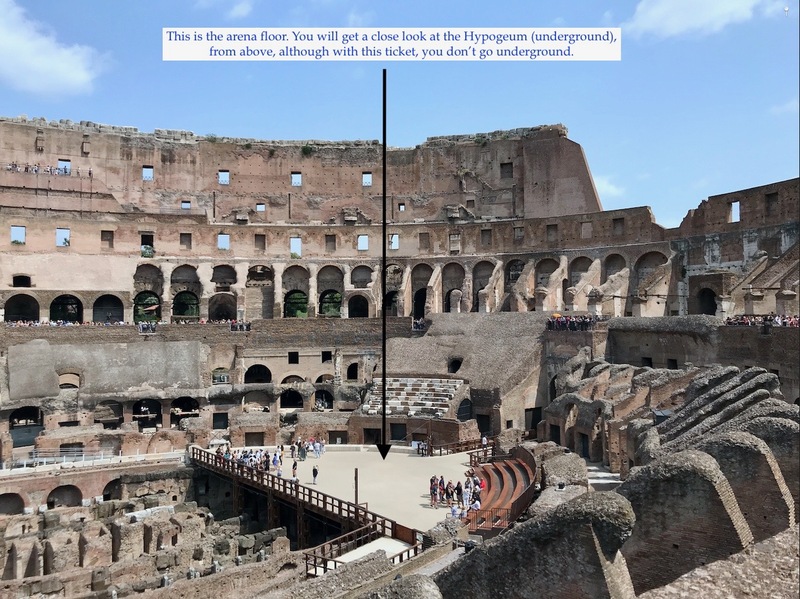 It's not too claustrophobic (if I can do it, anyone can), and you will get a whole different view of the Colosseum and its history from this perspective. You cannot just go on your own. You must go with a tour. This tour can be via the Colosseum directly (booked through CoopCulture), or, with an outside tour agency. You can only book this visit online. You cannot book it at the Colosseum ticket office. 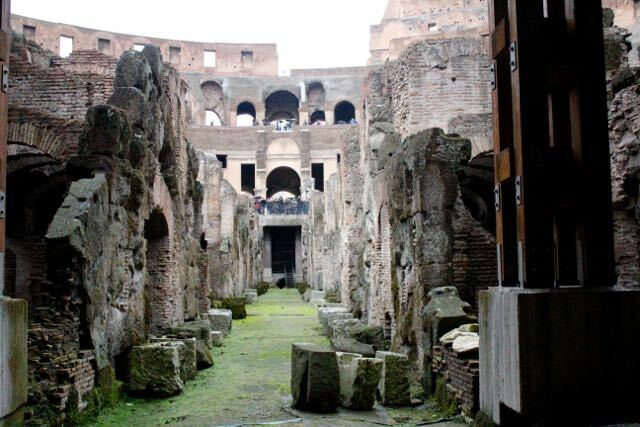 If you book a night visit to the Colosseum, the underground is usually included in that. While it's important to plan this in advance, you should know that they open availability for this on CoopCulture about 3 months ahead of time, for 3 months' availability at a time. So if you are trying to book this for say, 6 months out, you will find it unavailable. Just check back. First, you need to plan pretty far in advance. When you are ready to book, try to book on CoopCulture. Follow the steps as above, and instead of standard entry, select "COLOSSEUM, ROMAN FORUM, PALATINE ORDINARY ADMISSION + UNDERGROUND AND PANORAMIC VIEW". Then you will see the choices. Make sure to book the one with the tour in the language you want. Also, just ignore completely the underground ticket that has no tour. That is not for you to buy, it's for a private tour guide or a tour agency to buy. It's a little confusing to see that as the first choice when you get to the underground Colosseum tickets page, but don't let it confuse you. Your ticket includes a standard ticket to the Colosseum/Roman Forum/Palatine Hill, plus access and tour to the Hypogeum. The cost is 23€, plus a 2€ reservation fee. If you left it too late, and it's mostly sold-out on CoopCulture for when you will be in Rome, you can always try to book this via an outside ticketing agency, or through a tour company. This will cost more than booking directly on CoopCulture, but if it's important to you to see this, and that's your only chance, then you'll need to evaluate if it's worth it. In recent years, they've opened up the topmost tiers of the Colosseum and now you can visit those as a special visit. On a normal visit to the Colosseum, you can visit the main level and one level up. A visit to the Belvedere, or upper tiers of the Colosseum, gives you a fantastic vantage point and views of the Roman Forum and Palatine Hill, not to mention the entire interior of the Colosseum. Visiting the Belvedere is considered a special visit. You can book directly on CoopCulture, or through a ticketing agency. Your ticket includes a standard ticket to the Colosseum/Roman Forum/Palatine Hill, plus access and tour to the Belvedere. The cost is 23€, plus a 2€ reservation fee. As with the underground tickets, you can book this with a tour agency as well. They will likely add more things to visit to make it worth the extra cost. You can also book to visit the Hypogeum and Belvedere on one ticket. You can book this visit only via CoopCulture. Look for "Colosseum, Roman Forum And Palatine Regular Entrance + Undergrounds And Panoramic View English Tour". The cost is 29€. So far, I have not found this tour available with an outside tour company. If you want to visit the Colosseum Underground and Belvedere, make sure to give yourself plenty of time for all your visits. These visits alone take around 2 hours, so add that onto the time you will need for the Roman Forum/Palatine Hill. Your tickets to the Arena, Underground and/or Upper Tiers include a regular Colosseum entry ticket. This means that you also can visit the Roman Forum/Palatine Hill on the same day or even the next day. Don't let that visit go to waste! A night visit to the Colosseum is a fantastic thing to do. I think one of my favorite ways to visit the Colosseum is at night. It's nearly empty, and you really immerse yourself in the place and the ambiance. Since this is a seasonal event, you need to keep checking on CoopCulture for them to open availability. Some years, they've opened it in late March, and in others, in mid-April. And, because this is so popular, and because space is limited, do not be surprised to find it sold out for the dates you want if you are coming in high season. If you want to visit the Colosseum at night, and don't find availability on CoopCulture, but prefer to book through them since it costs less than a tour with a tour agency, my suggestion is to book a refundable tour with a tour company. Then, keep checking on CoopCulture to see if something opens up with them. If not, you have the tour as backup. First of all, it's limited to very few visitors at once, so when you go at night, you will feel like you have the place mostly to yourselves. 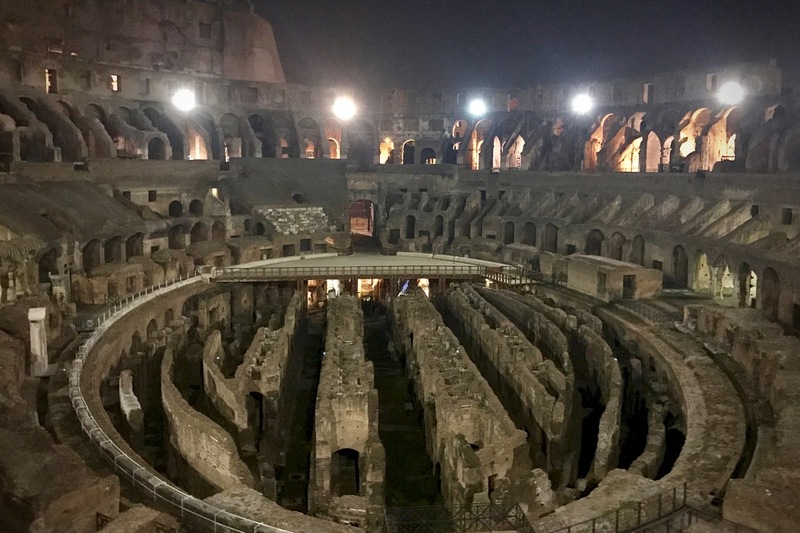 Second of all, a night visit includes a visit to the Hypogeum, and a visit out onto the arena. This tour is seasonal, and only goes from sometime in spring (announced sometime in March/April, usually) - fall (usually late October). You cannot just visit the Colosseum at night on your own. You must go with a guided tour. This can be directly through CoopCulture, or, you can book with an outside agency. When booking with an outside tour company, they usually combine this visit with some other things to make it a more complete tour. Night visits to the Colosseum are not part of the Roma Pass or any other Rome city pass. A ticket to visit the Colosseum at night is considered a special ticket. The Palatine Hill/Roman Forum are not included with this ticket. For more, visit my page all about visiting the Colosseum at night. This is the case whether you go with a guide employed by the Colosseum, a private guide, or a guide working for a tour agency. Avoid taking tours of the Colosseum with un-licensed guides. On the CoopCulture website, one of the options is to book a guided tour of the Colosseum. It costs only 5€ more than a standard entry ticket. This is an excellent way to get a tour of the Colosseum and save money, as it's not nearly as much as paying for a tour with an outside agency. Why does it cost so little? Is it as good as a tour you will get with a tour agency? I have had several tours with Colosseum personnel, and I've taken a lot of tours with private tour guides and various tour companies. Every time, it's a different experience. I cannot tell you that the tours with the Colosseum personnel are not as good as tours with a tour agency, but I will say that the tours I've had with tour agencies have mostly been fantastic. Since they are private companies, and compete with each other, they work hard to make sure you have enthusiastic, fun, knowledgable guides. When you book a tour through the Colosseum, you will get someone who is employed by the Colosseum. It is hit or miss what kind of guide they will be and if you will get a lot out of your tour. I've had good guides, and less good guides at the Colosseum. So it may come down to your budget and what you expect out of a tour. You can book these in advance right on the CoopCulture website to save tie, but you can also decide once one site if you want to get an audio guide, and just stand in the line to get one.